I got an email from Liz aka Herbiedog this morning to let me know that she will be returning to the forum next week due to her computer being broken and they are awaiting a new one. The email is below. Hurry back Liz you are missed. Just wanted to send you a quick e-mail to say I have not abandoned you all on the forum but I have been without a computer as mine has finally given up the ghost.. we have send away for a recon one so hopefully all being well I should be back in cyber world next week..
Shame to hear that your pooter broke, bet you can't wait for the new 1. Yes she will be back thank goodness I think we are all missing the herbster and Liz I will send on your messages to her. Hi everyone ..that you all for your lovely messages..well I am back with a new to me computer lot faster that my old one but noisy!!!! but I am here and that is the main point..
We have all missed you as well Liz a new faster computer that's great mine has a very loud fan in it so I understand the noise bit believe me. Hi Herbie, glad your back!!! 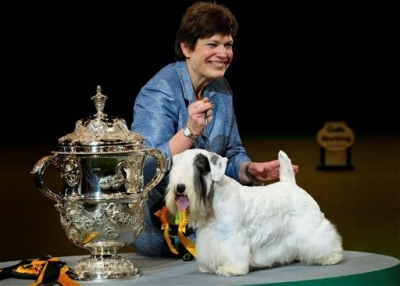 I think we are all so happy to see you back Liz... watched crufts last night on foxtel the sealyham terrier that got best in show as stunning shame the handler was as ugly as a hat full of assholes.... man the dog sure did out do her!! Must go and find a photo of her and the dog. Found one the dog was stunning!! The minute I saw him I knew he was something special. The Hungarian Vizla in the best in show line up was an Australian bred dog. Here she is don't know her name but the dog is much prettier than the handler this is an american dog. 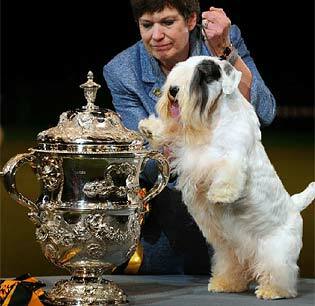 Luckily for her the show is judged on the dog merits and not the handlers. You are right about the handler!!! but that doggie is a real beauty his legs are just as short as our Herbie!!! Isn't he gorgeous!! The minute he first walked into the ring I though WOW!! Such a little stunner.... and a real showman.